Here was a great question posted regarding my post “The Thoracolumbar fascia, tissue depth, and specificity” as well as my response. Because it was such a great question, it allowed me to clarify some of the finer points regarding the Functional Range Release technique that I think you might all be interested in. As always, I welcome questions like the one below and enjoy the opportunity for discussions..
Super post as usual. But how do you “tension” a muscle considering the frictionless interface between the skin, fascia and muscle? Would you be able to flex a straight elbow by taking up the slack in the biceps with first your right thumb and then your left thumb and then your right thumb and so forth…much like pulling someone up on a rope. I would love to hear your thoughts on this. Regarding the “frictionless interface,” anatomists such as Gil Hedley would disagree with the findings of Dr’s Ross and Bereznik despite their attempt to demonstrate the relationship as such. When considering the different layers of fascia, the first being the fascia superficialis, which is also known as the “subcutaneous fat layer,” simple dissection procedure clearly demonstrates a great amount of fibrotic tissue connecting it with the underlying profunda layer (ie. the muscular encasements – endo, peri, epi). In fact, due to this relationship, even the concept of separating the layers is highly hypothetical. Anyway, it is due to the presence of these connections that we are able to create the “skin wedge” as many people like to call it. Therefore, the fact that an end-point can easily be found by sliding one layer past another demonstrates that at the end range, the fibrotic tissue must create “tension.” Further, as is noted by several authors (see my posts on the layers of fascia), in cases of chronic injury, the movement of the fascia superficialis on the profunda layer is hindered (ie. the skin seems to be ‘stuck’ to the the underlying tissue…the same happens with post surgical scarring)…treatment of this restriction, when given the proper time for the fascia to release, can improve the sliding. To me this demonstrates that there is an increased amount of abnormal ‘tension’ between the layers which can be addressed by imparting a load (“wedgie”) and allowing sufficient time to modify the fascial fibrosis. 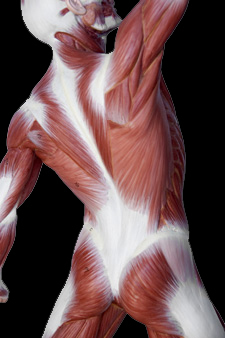 Regarding the underlying “muscle layer”….I don’t believe that this is EVER the target of our soft tissue therapy. If we are attempting to “break down adhesion,” where does the adhesion form? What is it made of?…..connective tissue (fascia). Thus our goal is to improve the sliding occurring between muscle cells by reducing fibrosis that occurs in the fascial components surrounding them. Regarding imparting tension on this tissue….this is the exact reason why my technique only treats at the outer ranges of motion. As you note, to try to apply tension into a tissue when it is shortened for example is futile. However, by compressing a lengthened tissue, you can cause a ‘bowing’ effect under your contact….when imparted during a stretch, you are conceptually increasing the intensity of the stretch under your finger….which would create tension at that point. That addresses my concerns. As you can tell my concerns weren’t really directed at you as at other practitioners. It was good to hear your take on the area. What you a wrote is a very good justification for your treatment and makes much more sense than some simplistic responses I hear given by “experts”.